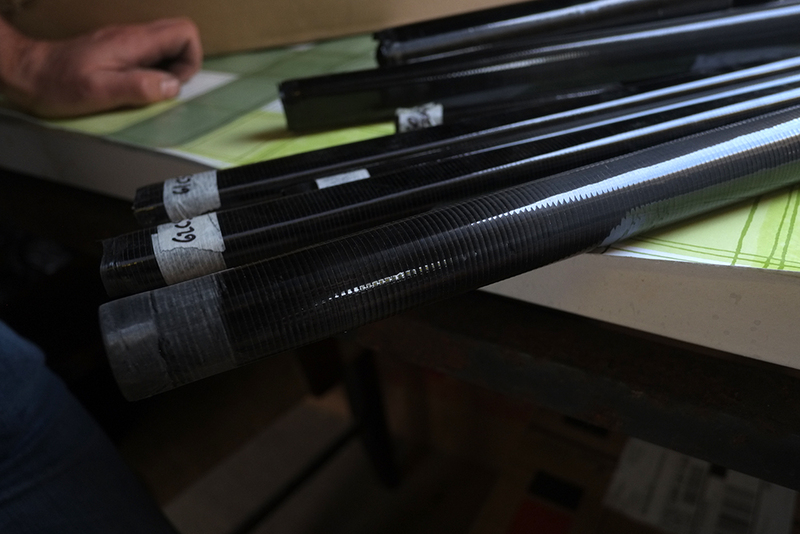 What comes to mind when you think of carbon fibre bicycle frame production? This is not a test. Just think about it for a moment and form a mental image. Me, I picture something clinical, sterile. Lots of computer modeling. A team of engineers. Sophisticated machinery. Automated processes. A facilities that is more lab than workshop. 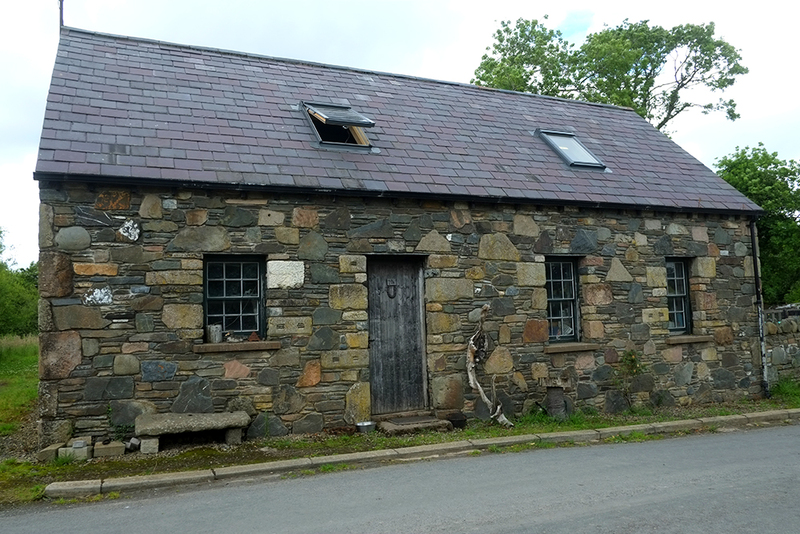 What I don’t picture is - oh, I don’t know - a stone cottage in the middle of the Irish countryside? 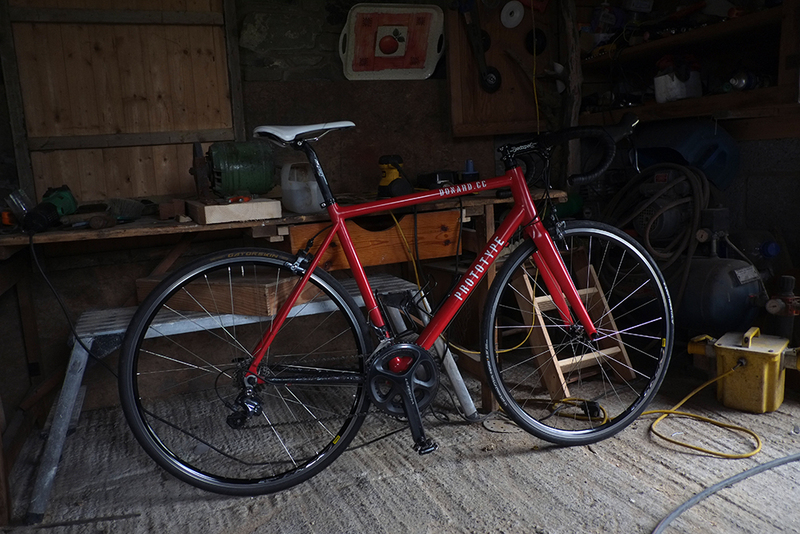 In which an unassuming, youthful-looking man toils alone, in a low-ceilinged attic workshop, sculpting strips of something black and tough and a little gooey into the shape of a bicycle. Yet that is what I get when I visit Owen Byrne at Donard Cycles. Even having known, roughly, what to expect from our email and phone conversations, I am still taken aback. To start with, there is the setting. Named after Slieve Donard that looms nearby (Northern Ireland's tallest peak), the builder resides in the picturesque countryside along the Strangford Lough. It took me several modes of transportation and several hours in pouring rain to get there, but the gorgeous views were well worth it. On top of that, the workshop is part of a resurrected ghost village. There are lots of such places all over Ireland: clusters of derelict stone cottages that were once settlements, usually situated on a cross-roads, around a mill of some sort. Once the mills closed and the crossroads lost their centrality, such places were gradually abandoned. Some were left to slowly decay, out of sight, deep in the coutryside. Ohers were knocked down and turned into new developments. This particular settlement, however, was fortunate enough to meet an alternative fate: It was rescued by local residents. Most of the derelict buildings have been refurbished and made habitable again. It is now a thriving, yet secluded, little neighborhood that is like something out of a picture book. 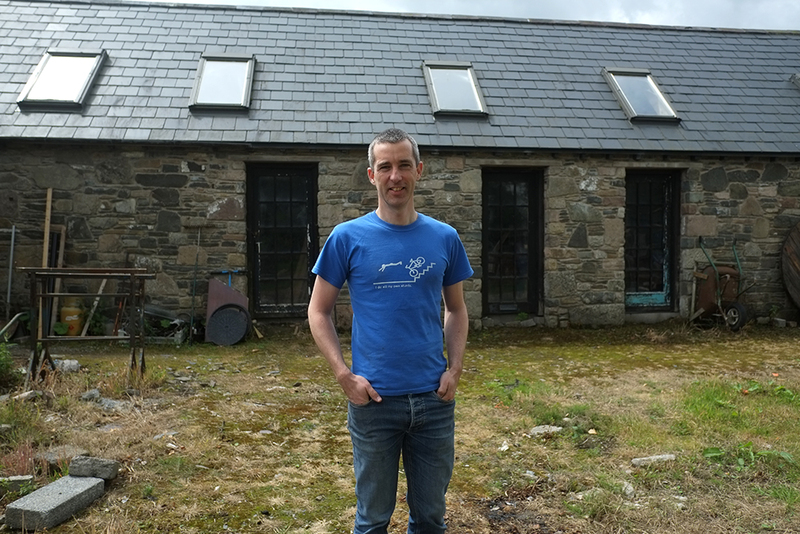 Once not much more than a stone shed, the Donard Cycles workshop has somehow been transformed into a two-story structure with a multitude of skylights. 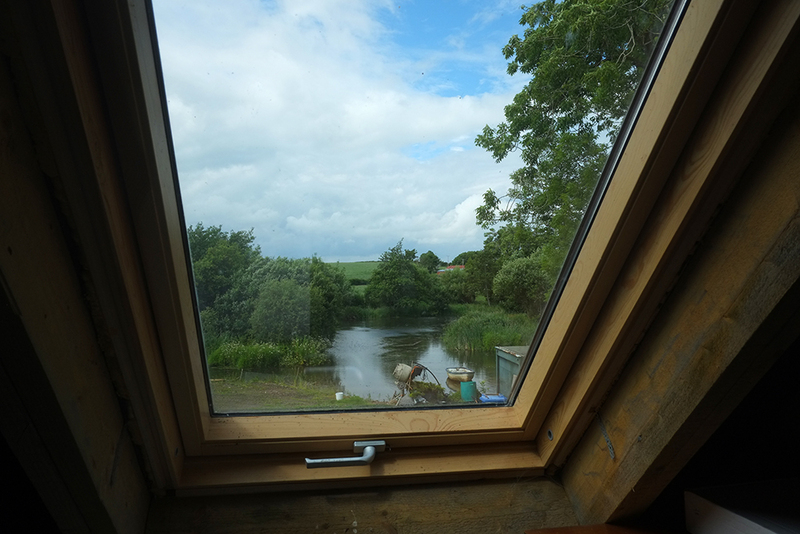 Surrounded by a grassy yard dotted with wildflowers, it stands beside a pond that dominates most of the views from the workshop windows. 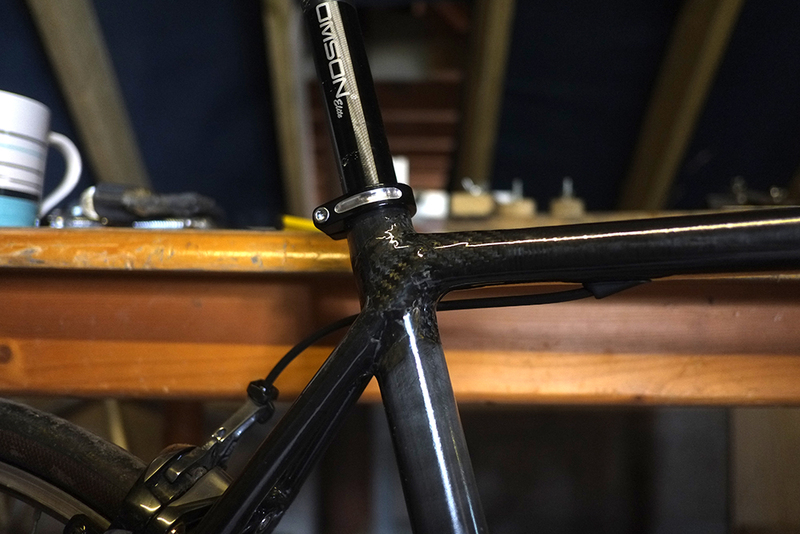 It is this that the builder gazes at as he works: making one carbon fibre prototype frame after another, in a sharply focused R&D sequence that will culminate soon in a polished product available to the public. In the dim, yet surprisingly airy interior (best air quality of any framebuilder's workshop I've been in), I am permitted to inspect several early prototypes - some intact, others chopped up and modified, all looking more like papier-mâché sculptures than machines. There is familiar, steel stuff, as well. As well as a frame jig, vices, and all the tools of the trade I'm familiar with. 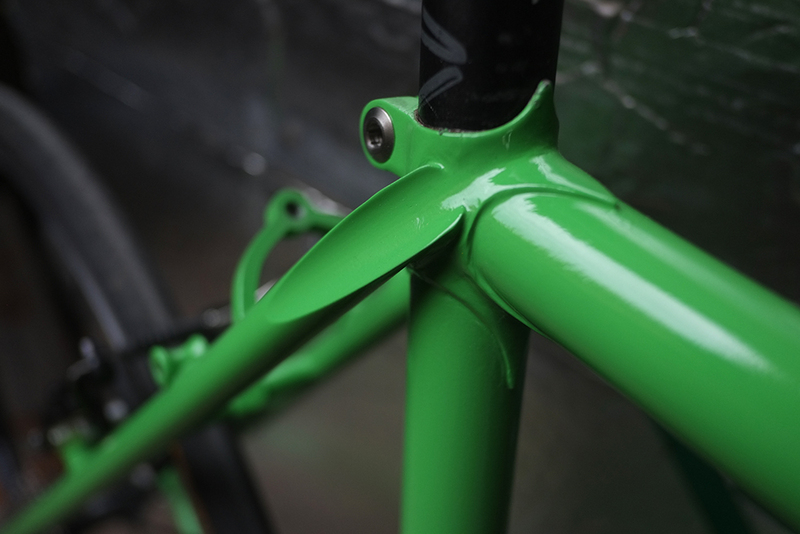 As a hobby at first, Owen began building bicycle frames in 2012. But the metals he started out with were practice for his ultimate goal: to work with carbon fibre. And last year that process finally began. The carbon stuff is everywhere - finished tubes, and strips, and parts of frames - placed so casually in this quaint workshop setting my mind finds it difficult to accept as real. Overwhelmed but curious, I do not know where to start with my questions. I jump from one topic to the next. I start touching and sniffing everything. How does this work? What does this do? But how? But why? But what for? "Want to try making a tube yourself?" Making a tube... I imagine some sort of giant mold is involved. But no, the process is all handwork. 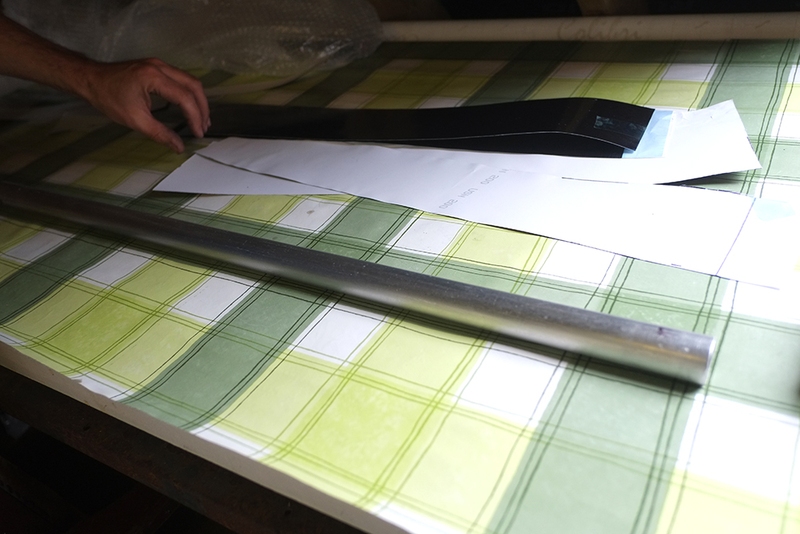 To start with, the carbon comes in strips, sheets, or ribbons of epoxy-impregnated fibres. There are many kinds - that is to say, they come in different thicknesses and types. A strip of carbon fibre that is unidirectional resembles woodgrain and is a truly weird thing to hold and play around with. Flexible in one direction, it resists flex in the other. The unidirectional fibre alignment makes it possible to control directionality of strength and stiffness to a fine degree, depending on how you place the strips. 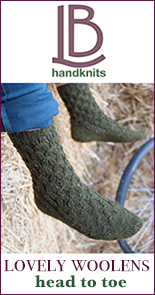 Woven, fibre, on the other hand, is - as the name suggests - a weave, offering greater versatility but less directional control. 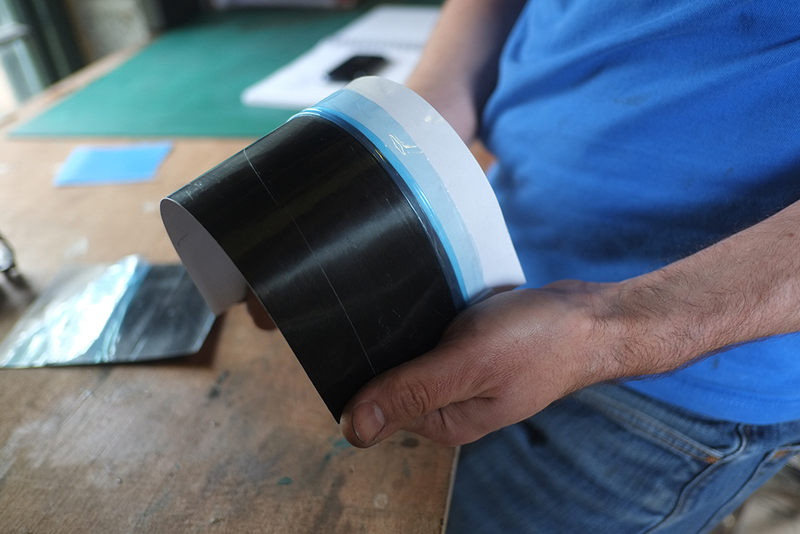 Both types of carbon fibre strips are available in different thicknesses and strengths. And they can be layered in different numbers and combinations depending on what effect the builder wants to achieve. To make the tubing, the builder begins by wrapping the strips, one at a time, around an appropriately shaped aluminium rod made specifically for this purpose. At Owen's invitation, I tried my hand at this part of the process. 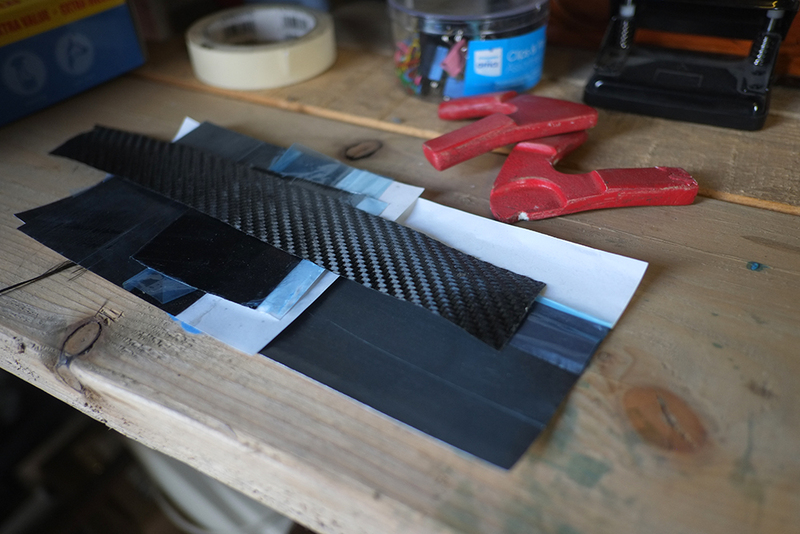 At the start, the carbon fibre strips felt a lot more difficult to control than I expected - an uncooperative combination of stiffness and flexibility that refused to curve and lie flat around the aluminium rod without bunching up horribly. However, I soon realised that both materials were quite responsive to body heat; they needed to be gently warmed up. The more you touch the aluminium, the more inviting the surface becomes to the carbon. And the more you coax the carbon with your hands, the move lively and pliable it becomes. So the wrapping process basically involves a lot of kneading and smoothing, smoothing and kneading, until you have an evenly wrapped tube. 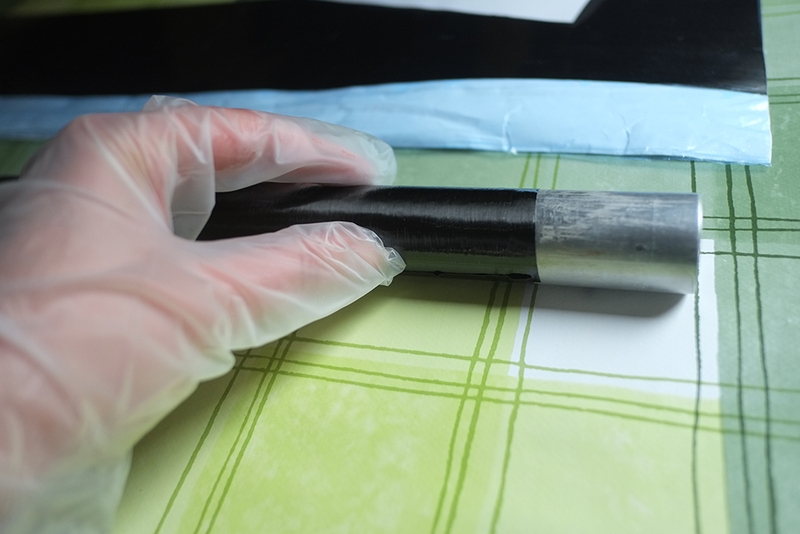 Once wrapping is completed, the tube gets placed in a vacuum bag for compression, and in an oven, where it undergoes a number of heat cycles at varied temperatures. It is a time-consuming process, both design-wise and production-wise. 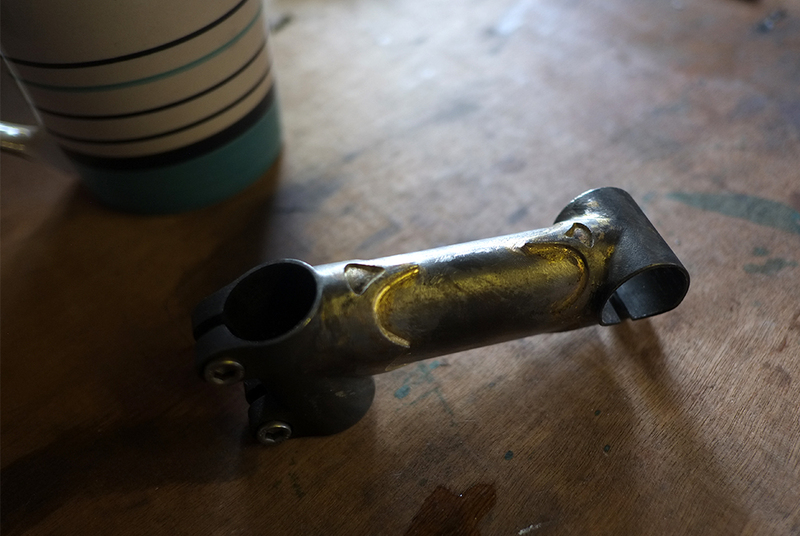 But the results is a handmade and highly customised tube set, which can then be fitted onto a jig just like steel tubing, for the frame to start being built. Though I did not watch this part of the process, I understand the frame is built by wrapping more fibre strips around the joints, in leu of brazing or welding. Here again, the builder has complete control over the type of carbon fibre selected, its directionality, as well as the amount of material used. Between designing the geometry, making the tubing from scratch, and then wrapping the joints, the possibilities for playing around with frame characteristics seem infinite. And my point here was not to attempt to explain the carbon fibre frame production process (which would take at least a couple of book chapters to describe properly! ), but to communicate the two things that struck me about it the most from visiting Donard: (1) how utterly hands-on it is, and (2) how much opportunity for customisation it offers. And so before we even got to addressing the question of why Owen was drawn to making carbon bikes in particular, I already knew the answer. Or at least one of the answers. Because, let's face it - being interested in a material's hands-on and customisable properties isn't enough to work with something as complicated and sensitive as carbon fibre. And so it might clarify matters to know that Owen has a PhD in Physics, with a specialty in high temperature super conductors and a keen interest in composites. And as a cyclist with several decades of experience (distance cycling, commuting, and racing across various disciplines), it was only a matter of time before he felt drawn to applying his skills to the bicycle. After some initial training in framebuilding with Downland Cycles in England and some practice with steel, he set to work with carbon fibre. Back in Ireland, he did not have any teachers, or the presence of a framebuilders' community from which to seek support. But he read a great deal. And then he read some more. And then he began experimenting. 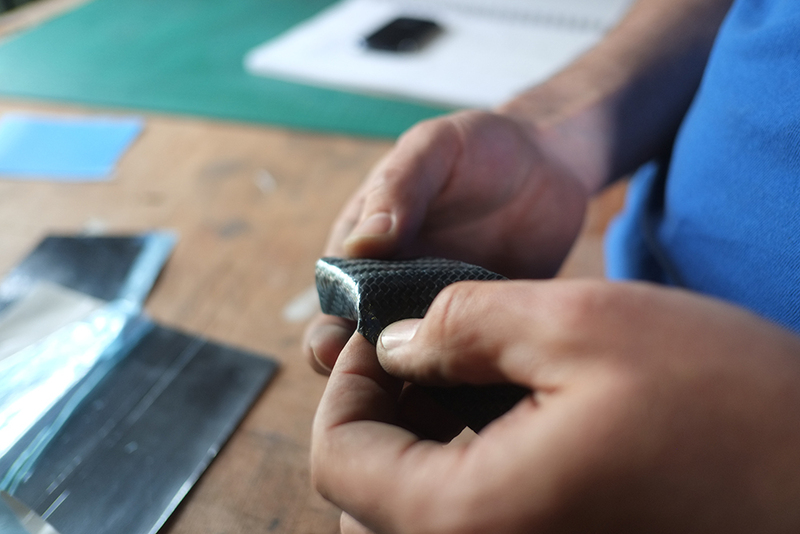 Owen sees carbon fibre as a material with greater potential than we yet credit it with, in particular for custom work. And he feels that he understands that math(s) and physics behind carbon fibre's behaviour at a level that can be applied to bicycle frame production, with exciting results. Results he is nearly ready to show. The cycles which now fill his shop are aesthetically unpolished prototypes. 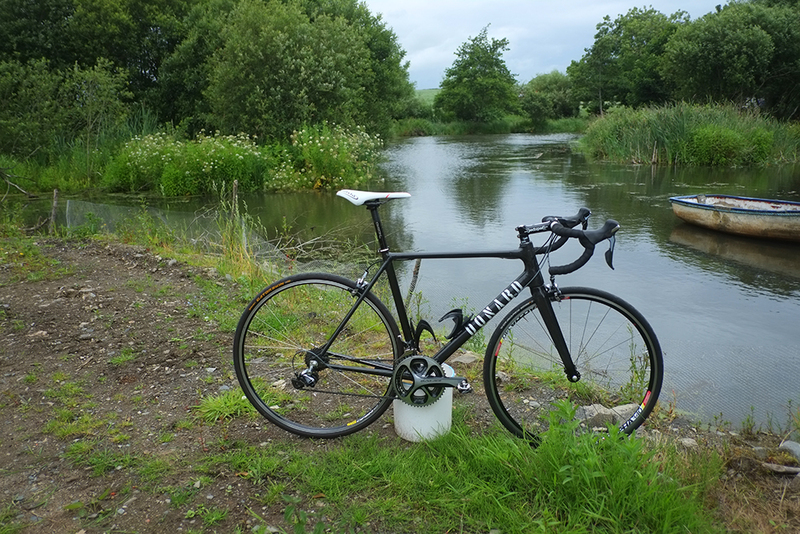 But the first ready-to-view bike, complete with professional paint, will be unveiled at Lap the Lough event - a 100 mile ride around Lough Neagh at the end of August. So look for it there in person, or stay tuned for photos. In the meanwhile, Owen asked whether I'd like to try the latest prototype. Considering the bike was a good 2 sizes too big for me, equipped with a frighteningly narrow saddle, and sporting clipless pedals incompatible with my shoes, I politely declined. But of course this is Ireland. And so a "go on, g'wan!" situation ensued, with assurances of "Sure, we'll just lower the seat - you'll be grand!" given. So, long story short, of course I ended up riding the bike. The geometry was all wrong for me and the fit was positively Riverdellian - with bars above saddle and my torso stretched out to the max. But nevertheless, ride it I did, for some miles over gently rolling hills. Alongside, on one of his other prototypes, Owen glanced over now and again, questioningly. Main impression? Comfortable. In a "can't feel the texture of the ground" sort of way. Not the typical feedback one expects of a carbon bike, and I guess that is the builder's point: They can be anything you make them. And although the geometry and fit put me in an awkward position, the bicycle appeared to get lighter when going uphill. What can I say? I am certainly intrigued. And would love an opportunity to test a Donard in my size, to form a fairer impression. But of course to make one in my size would not be enough, according to the builder. He would want to know how much a rider weighs, to watch how they ride, to understand the ways in which they stress the bike, and their approach to handling. He will not be making bicycles designed to please the hypothetical average rider. He is interested in pushing limits, in the context of making frames that are as rider-specific as possible. And in making them from scratch - from the tooling, to the tubes, to the finished product... Then ideally, selling them at prices he describes as "accessible for locals." 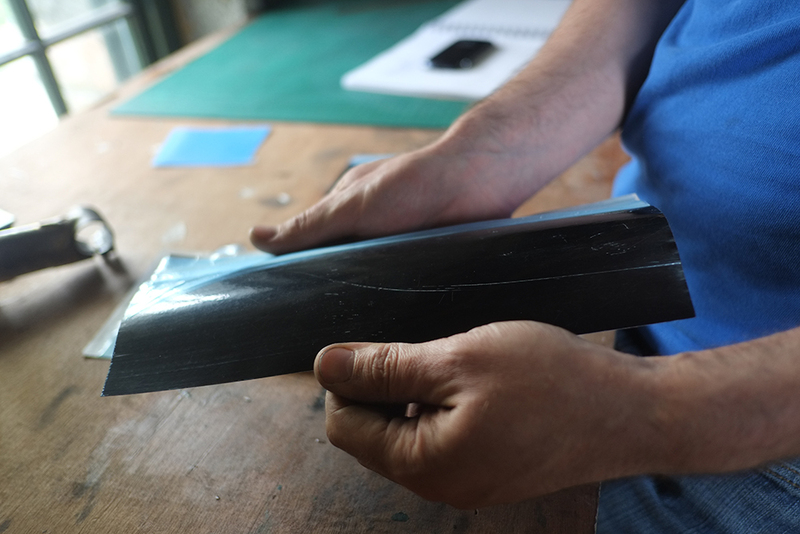 This admirable approach aside, my visit with Donard Cycles has given me a different perspective on carbon fibre framebuilding, which I hope has been of interest to you as well. 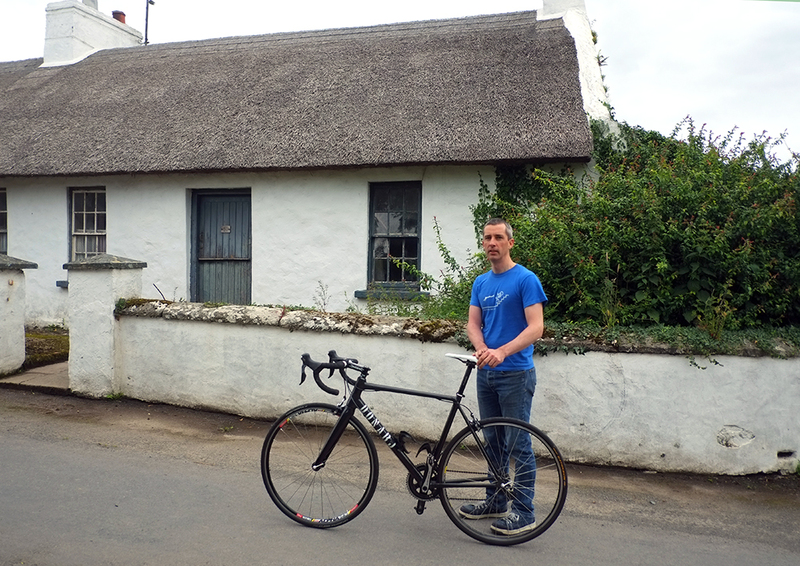 I thank Owen for his hospitality and look forward to seeing his Lap the Lough bike in action. Very interesting and great photos - what a sweet place to live, wonderful that some of these settlements are being revived. The dedication involved in producing these bikes is something to admire, I would not have imagined carbon frames produced in this home-industry environment. I hope Owen's Donard Cycles has every success and look forward to seeing photos of the completed bike when it is unveiled. My LBS does carbon fiber repair. Also alterations, modifications, customizing. The proprietor was part of the team that created the original Kestrel frames, so he has been doing CF layup for thirty years now. In practice, he does very few repairs. The public believes that the work happens in laboratories and clean rooms, not workshops. Articles like this one move the image in the right direction. When the public has a more real notion of how the game is played, then CF fabrication will have more possibilities. 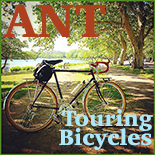 "What comes to mind when you think of carbon fibre bicycle frame production? This is not a test. Just think about it for a moment and form a mental image." We still have that bike and it's a joy to ride…better than a joy. I'm glad there are people like Owen out there with ideas and patience and a willingness, or stubbornness or whatever it's called, to create something new. I hope he creates a demand for his work. Fascinating in so many ways. But most of all I want to know more about the ghost villages. There is a really beautiful one in Dunlewy, Donegal, that I often visit. I will put up a photo essay when I have a chance. What is the name of the Strangford village / townland where Owen is based? I did notice that he didn't have any address on his website... I'm from NI originally so was fascinated where the location was but I'll ask my questions outside of this website! 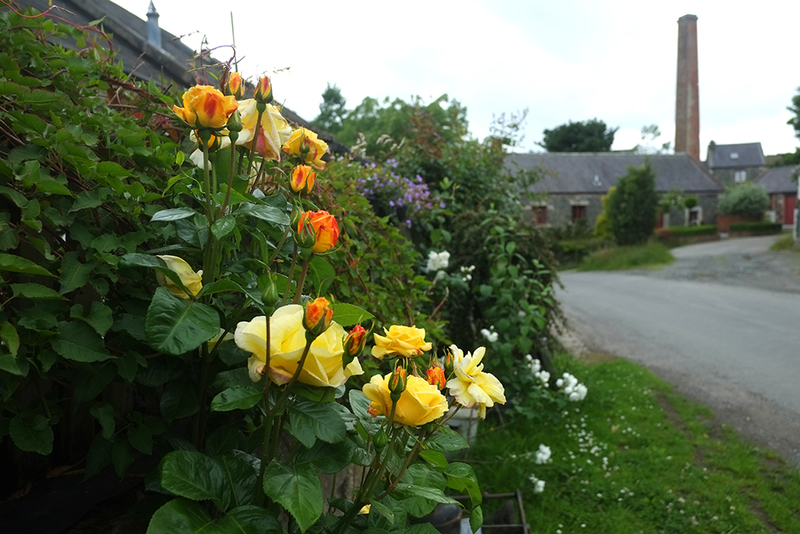 I'm based at an old milltown near Mounstewart. It is the site of a flax mill (and other things I think) If you don't know, flax was used to make Linen, for which Northern Ireland and Belfast are famous. By coincidence, Museeuw used flax in their carbon frames to reduce vibrations - maybe I'll have to experiment with that. There is an active mill in Dungiven with a lovely open house/ festival in September, well worth a visit. Flax enjoys a long history in plastics- it has been used in forming Bakelite and later Micarta objects for more than 100 years. You could claim tradition! Interesting indeed. As the tubes are sculpted by hand, can they be any shape at all or is the builder still limited by standard parameters? In a sculptural sense I suppose they can be any shape at all. But in a functional/practical sense there might be limits to do with stress points. For instance, I wouldn't think it is advisable to make (and ride) a carbon fibre loop frame. Though I could, of course, be wrong! There would be no technical problem at all building a CF loop frame. You would need to find a builder who wanted to take it on and you would need to bankroll the project. It would actually be a good way to deal with the flexibility/weight issues that come with loop frames. I've asked the builder to comment on this and am curious myself. They do make curved CF forks after all, so the curvature itself shouldn't inherently be a problem. There are lots of builders doing complex fabrications. 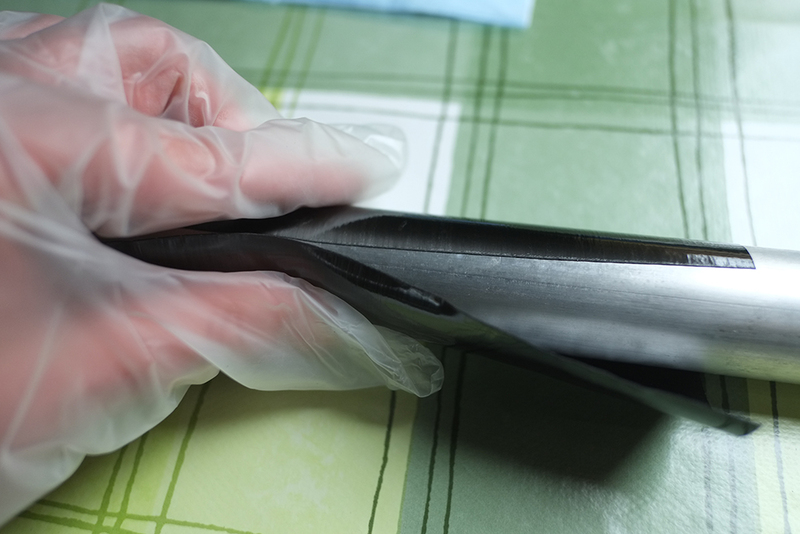 All of the carbon is shaped onto a mould by hand, so a mould is still required. For more complex shapes, I make the moulds by carving the shape of the part I want from wood or mdf first. It could be done by 3D printing. For straight tubes, the moulds are metal tubes of the right size. There's not really a lot of limitations other than the cost of making any specific moulds. Velouria – there are no limits – a carbon ladies’ loop frame with a ‘Frascona curve’ virtual top tube would be seriously cool (although I expect you’d have to explain to Owen what a Frascona curve is, and he may or may not think it’s a cool idea!). Actually, it’s really just a 90 degree angled tube, and the long mitre up the seat tube might be easier to fabricate in carbon than steel (not that I’ve ever fabricated anything), but I remember Mike Flanigan saying under one of your posts about Italian city bikes that he wished he had a bender with a large enough radius; what he had was close but not quite close enough. With carbon, you’d still have to bend whatever you were using as a mould, but you’d only have to do it once then run off copies. Actually a loop frame looks like a really interesting project from a few different perspectives. That could be a seriously cool bike and it's going on my list of potential projects. If anyone wants to help move it up the list - get in touch! The hardest part is going to be the aesthetics. Loop frames evolved from the exigencies of working with steel. If this builder can see the way forward I sure hope a patron steps up. Do we get CF mudguards, chain case and rack too? Not only because it's being done on a human scale by a human who really wants to do it and do it really well, but because it's one more person using carbon fiber in a more creative and rational way than just to build cost no object examples of the absolute lightest piece of throwaway kit (or something cheap parading around as the lightest possible piece of throwaway kit at a slight discount which is maybe worse). Carbon bikes don't really excite me but the idea of maximizing that materials flexibility to make cool bikes that "can be anything you make them" as you put it, instead of what they so often have been, is a great thing. The fact he's hoping to make them as well as he can AND more affordable is a freaking noble thing as well. Thanks for sharing. I recall you had good things to say about Parlee Cycles as well and wonder how the two would compare. Good to see you are open minded about materials anyway despite a preference for lugged steel. This is a question - just arising from what are supposed to be the "terrors" of carbon. Custom bicycles are highly individual. Carbon is supposed to be quite strong, but joints and unexpected forces are risks. I wonder how quality control is done? Obviously, this is a success story but I wonder how it was done. Good for him. I think that's a good question for anyone who makes one-off frames, no matter what materials they use. Will invite the builder to respond. I should say that I've numerous years experience as a testing and QA professional. I've tested products for many of the major consumer electronics companies, and tested instruments used for Neuro-science research, and developed quality assurance programs for many TV networks around the world. 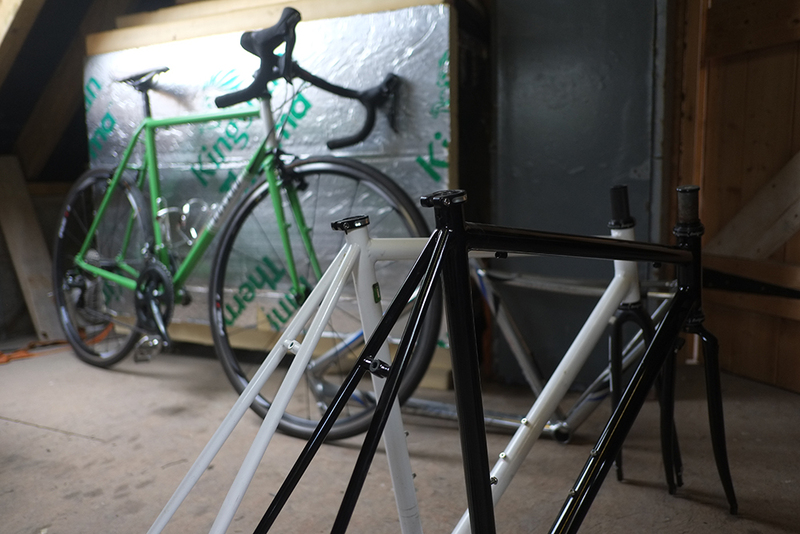 For the bikes specifically, I've built a bunch of jigs that allow me to test individual parts, joints and complete frames, the data from which is checked against theoretical calculations and publicly available data and my build process has numerous QA checks. I'll also undergo independent testing in the near future. I've seen carbon frames far outpassing other materials. The terror is that carbon fails in a very dramatic way, where as metal bends first, so isn't so dramatic, but there is no reason why carbon bikes should be any weaker. Looks like a straight on racing set-up Who else would go this route? What would one of these cost? I think the builder is still trying to figure out costs, and it will partly depend on how fast he can train himself to make them. The info should be available in a couple of months probably. 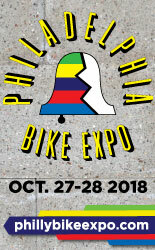 In theory, anyone who is interested in a lightweight roadbike with highly customised ride characteristics could potentially benefit from going this route. The bikes in the pictures are all slightly more relaxed geometry than full on race bikes but I'm open to discussion on other styles of bikes in the future. Pricing wise, I would prefer not to say on a public forum just yet, but I'm hoping to be competitive with other custom builders. 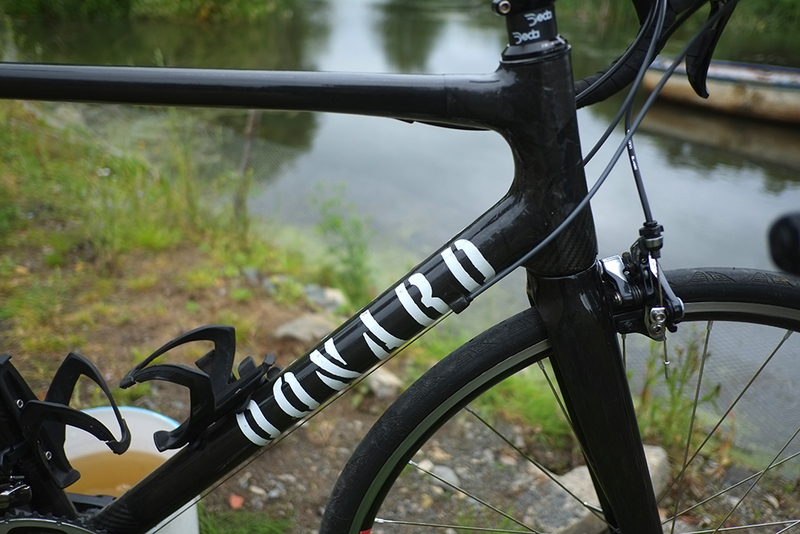 The construction method seems to owe a lot to Parlee. That's not a criticism, but for a different approach, look at what Alchemy is doing these days: really impressive for a custom builder. Still, another dedicated craftsman working in modern materials can only be a good thing. I love my Seven, but I think we've taken Ti about as far as it can go. I remember seeing Alchemy bikes in person at a bike show, though don't remember which now. Certainly some interesting stuff from them, as well as Argonaut. What about the "lugged" Ti+ carbon bikes, a la Seven and Firefly? The 622SLX project I am now riding is interesting, to say the least. 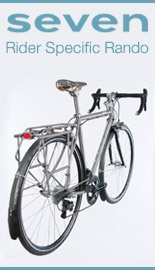 I also find it interesting what Rob English does with his lightweight steel/ carbon insert stuff, such as this bike. The choice of materials, as well as the ability to mix and match them to suit individual riders, is a great thing about today's framebuilding scene IMO. I'm happy to follow in the footsteps of the masters of bicycle making in any material. Every bike I've made is step forward from the previous, and I have many ideas for new approaches in the future - stay tuned! Velouria - I actually own a Seven Elium, which is mixed Ti and Carbon. Beautiful bike, and fits me perfectly of course. But we're still talking round tubes, if highly refined ones. I see from your photos that Owen is beginning to experiment with shaped tubes. It will be interesting to see how far he can take this as a sole practitioner. Alchemy has made large capital equipment investments to enable manufacture of their shaped tube frame sets. The trade-off is that it appears to be pushing them in the direction of small-batch building, though you can still order full custom for an up-charge. We're starting to see a high-tech vs. high-touch thing play out here, and hopefully that leaves a niche for Owen and folks like him. I am wondering in what context are shaped tubes seen as beneficial? Is it purely an aero thing, or are there other benefits? Shaped tubes are a means of increasing rigidity. It's about putting rigidity where you want it. Which to me constantly begs the question why do you want so much rigidity? Did the bikes really behave that badly with round tubes? Much of the fashion is bleed through from MTB. When designing frames with suspension you can't possibly have too much rigidity. The suspension won't work if the suspension mounts do not remain in proper orientation. Aero benefits only apply at speed, higher speed than aero purveyors want you to think. Wind tunnel testing is expensive, results need a lot of interpretation, tubes are shaped for any reason or no reason and a gloss gets put on it when writing ad copy. Ah right. I was under the impression that even mainstream roadbike manufacturers were now in a post-"more rigid = faster" mindset, but I guess I was mistaken. Here's a late 60s/early 70s frame that weighs 144 grams more than the English. I own a 1958 23-1/2" frame that weighs about 300 grams more than the English. The old bikes are of course all steel. The common denominator is craft. The craftsmanship looks pretty good and no doubt will get even better as he perfects processes and techniques. And speaking of craftsmanship: That stone shed is something to behold. I'll be sure to pass your comments on to the person who rebuilt not only the shed, but all the surrounding buildings here.